Unusable, forgotten bikes are mainstays of the NYC streetscape, hogging bike parking for months and even years before they meet the Department of Sanitation’s standards for removal. DSNY has proposed a rule change to loosen its criteria, but advocates say it doesn’t go far enough to solve the city’s abandoned bike problem. Under current rules, staff check on a bike once it has been reported via 311 and tag it for removal if it meets the criteria. If the tag is not removed by an owner within one week, the bike gets impounded. DSNY’s proposed change would lower the threshold for removal from three criteria to two and lower the rust threshold to 50 percent [PDF]. Additionally, “flat or missing tires” would no longer be one of the criteria for removal. DSNY held a hearing on the rule change August 9 and must now determine how to proceed. Advocates and elected officials who testified at the hearing don’t think the proposal will improve matters much. Recycle-A-Bicycle Executive Director Karen Overton, who testified at the hearing, said even the new criteria will leave countless abandoned bikes rotting away on sidewalks. Overton and Recycle-A-Bicycle conducted their own evaluation of the city’s current practice. They found that when DSNY responds to abandoned bike reports and marks the corresponding 311 request as “complete,” that does not necessarily mean the reported bike has been removed. Recycle-A-Bicycle asked New Yorkers to report abandoned bikes to the city and monitor whether they were tagged or removed by DSNY. Of the 26 bikes identified, some hadn’t been moved in years. 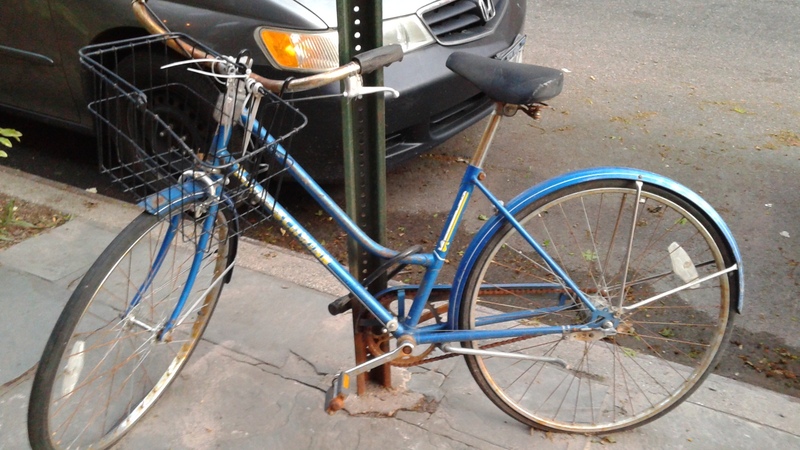 One person who volunteered, for instance, said the blue Schwinn below has been reported repeatedly for three years and never even been tagged by. Manhattan Borough President Gale Brewer’s office also conducted a study. Staff identified 378 bicycles in the area south of 14th Street that “appeared to be derelict,” of which 284 would qualify for removal under DSNY’s proposed criteria, compared to 188 under the current system. In her testimony, Brewer suggested that keeping flat or missing tires on the list of criteria could bring that number up to 355 [PDF]. A DSNY spokesperson would not provide a timeline for a final decision on the proposed changes. Once the new rules have been determined, they’ll need approval from the city’s Law Department, according the spokesperson, after which there is a 30-day waiting period before they take effect. Reduce it to just one criteria in order to remove. Why wait for the bike to deteriorate? Also add the following test, attached to government sign. I believe it is illegal to attach to road signs and structures anyway. That would be too strict – imagine, for example, you went out of town for a few days with your bike locked in public (because millions of New Yorkers don’t have bike parking inside their building, or live in high-floor walk-ups, or simply don’t have space to bring a bike into their apartment). If some idiot backed their car into your bike, damaging it, the city could potentially junk your bike before you had a chance to get to it. That would be a perfectly repairable bike lost to you. Not enough bicycle parking to ban locking to street signs. Strictly enforcing a ban on locking to street signs would effectively mean there is almost no legal place to lock your bike in NYC. By your interpretation of the rules, all of NYC has to share the 3 racks within a block of Bryant park as one example. I seriously can’t believe all that many people leave their bike chained outside on a public sidewalk when they’re not using it. Putting aside the high probability of theft or vandalism, the bike rusts away doing that. I know NYC apartments are often tiny, but they have ceiling-mount bike racks. Any bike I care about would get stored inside, either in my residence, or a secure, locked storage area. No, signs should be used for bike parking — saves space. Another example is the protective bars around the street trees in Germany. They double as bike parking. That said, I agree that stray bikes should be cleared away quickly. They are a nuisance. What about the mounds of rusted locks that pile up around the bases of bike racks? DSNY never seems to remove those. I’ve lived in situations where it’s impossible to bring a bike inside. Three roommates, tiny rooms, small living room. Our landlord didn’t allow bikes in the hallway. Outdoor bike parking was our only option! And that’s just for roommates. Providing outdoor bike parking means that families with multiple generations under one roof can all rely on a bicycle for transportation. Many of my neighbors wouldn’t be able to fit bicycles inside. Sounds nice in theory, but is dependent on signs and protective bars having been placed in a manner that allows bicycles to be locked to them without obstructing pedestrian traffic. I don’t think that’s a reasonable assumption to make. Why try to cheap out on this? Have the city conduct a block by block bike parking study, come up with a way to mark signs and other fixed objects where it’s acceptable to lock bikes, and remove car parking at corners to install bike corrals where more bike parking is needed. Get a cheap bike ($50) whenever you run into a store. You’ll find that bike theft/vandalism isn’t nearly as big a concern as you think it is. You’re the equivalent of the suburban guy that won’t come to NYC because they’re afraid they’ll get mugged or murdered. Sure it happens, it’s just a massively overblown concern. You’ve said you walk a few miles for errands. Worst that happens is you’re out a cheap bike, a good lock, and you have to walk a trip you would have walked anyway. I don’t know about that. I’ve parked a bicycle outside for about three years now. I have pretty much everything locked down on it, but the brake pads could be removed. One day I came out of the apartment to use it and thankfully I noticed that the brake pads were gone! I also parked my girlfriend’s bike outside. I had locked everything down including the seat post but had not yet gotten to the saddle clamp. Well, someone came along and unbolted the saddle clamp and stole the saddle. Not like it was a great saddle either. This happened on the UES. If you park a bike outside, you’d have better invested in a very high quality lock and lock down every component on the bike you don’t want to disappear. Otherwise it will. I would suggest that New York City use the 28 day rule. After four weeks, the bike will be removed. I might be notionally OK occasionally chaining up a beater bike while running errands but not leaving one outside 24/7. If nothing else, the elements would take their toll. For what it’s worth, my old Raleigh was literally starting to rust out from under me despite being stored inside. That’s one of the reasons I bought my titanium Airborne. No way would I leave that bike outside 24/7. In fact, I don’t even keep it in the garage (we’ve had the garage broken into twice). No big deal bringing it upstairs from the basement whenever I ride. Funny how we have minimum parking requirements in much of the city but it seems like it’s too much to ask landlords to provide storage for a few bikes per apartment. I know many people who do with cheap bikes like ahwr describes. And there are fairly nice bikes (like $400 mountain bikes) parked outside the apartment building next to mine every night. But people do it.Full stop – they do and it is not that rare. Please stop describing the world the way you think it is or interpret it, and open your eyes. The solution is very simple. Dramatically reduce the criteria but INCREASE the time period between tagging and removal. If the owner doesn’t move the bike (or fix it and remove the tag), it’s gone. I think a month is reasonable. DSNY is just afraid that one bike will be mistakenly removed and it will make the front page of The Post. It’s not “interpretation” that a bike left outside will deteriorate rapidly from the elements, usually starting with the chain. Between theft, deterioration, and vandalism, I’d be surprised if the half-life of a bike left outside 24/7 is much over a year before it disappears, or is rendered unusable without serious repairs. The fact that some people may do it doesn’t mean it’s a good idea. I’d much rather as cycling advocates that we work with landlords to give us safer, indoor bike storage. It’s not like a bikes take up a ton of space. It seems to me there are better answers than taking your chances keeping bikes locked to lamp posts on public sidewalks. It just reinforces the second-class status of cyclists in this city. Many in your world. I rarely see it by me. Even the restaurants put their delivery bikes inside after they close for the night. Please stop describing the world the way you think it is or interpret it, and open your eyes. You might also have a website which posts pictures of removed bikes and the location where they were removed from. If nobody claims them within a reasonable amount of time (3 months?) then they get donated to places like Recycle-A-Cycle. Tagging a bike for, say, two weeks, and then removing strikes me as more than reasonable. If you don’t use the bike, or even walk by to check on it, once in two weeks, you clearly don’t care about it. It’s not unreasonable to expect people to take that much (minimal) responsibility for their personal property. Streetsblog decries drivers storing the private property on public streets, so why shouldn’t the same principle to an extent apply to bicycles? Bike parking in many neighborhoods is a limited resource, so don’t we have an interest in ensuring that bike parking is available for bikes that are actually used? It’s a pity NYC isn’t open-minded enough to do something like this. Bike corrals at corners accomplish two things—daylighting intersections and providing much needed bicycle parking. Start by picking locations where lots of bikes are chained to street signs, indicating an unfilled demand for bike parking. Eventually try to cover at least all major streets with bike corrals on every corner. If you say something does exist, and yet it does exist, the problem is with you. Your experience is too limited. It’s interpretation that because of that people don’t leave bikes outside. They do. All the time. 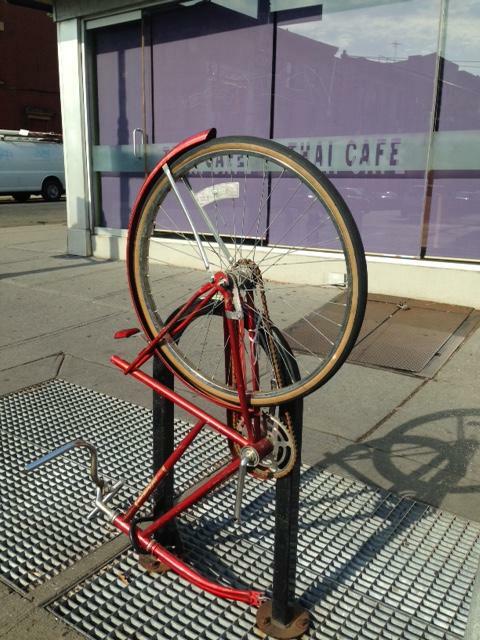 If you give even the smallest of sh!ts about the bicycle you own, you don’t lock it up outside overnight in NYC. Isn’t this a cardinal rule of city life? I didn’t say it doesn’t exist. I said I’m surprised if all that many people do it. The fact you see “lots” of bikes left outside 24/7 means squat without knowing how many bikes people on that block have (which could easily number in the hundreds, even thousands, given the density in Manhattan). It’s sort of like saying heavy traffic and lack of free parking spots for cars indicates lots of people in Manhattan are getting around by car. The point is that Manhattan is so densely populated, it only takes a minority of people doing something to make that something readily visible. One in 100 people with bikes who keep their bikes outside where I live might mean I walk for many blocks before seeing a bike chained outside. Where you live it could mean every single street fixture has bikes chained to it. One of the problems with Streetsblog is the readership seems to be heavily biased in Manhattan and downtown Brooklyn. Before you or anyone else start in about my experience being too limited, I have gone into Manhattan a lot. I’m familiar with what goes on there, including seeing a lot more bikes chained outside. But that doesn’t imply this is at all typical for the rest of NYC. Lots of people who live in the outer boroughs go into Manhattan regularly for either work or entertainment. Based on a lot of the comments I read here, it seems Manhattanites don’t get into the rest of the city as often. Which is exactly what I’ve been saying but it seems people are handing my head to me over it. Right. And a lot of those same people will be pissed off if/when their bike is stolen or vandalized, even if people like me tell them in advance it’s a horrible idea. Here’s a bit of personal experience. I actually advised a friend not to keep their bike outside. Three times it was vandalized. Three times I fixed it for them at no charge, using some spare parts I had. I always followed this with the advice of “stop keeping it outside”. I forget what their excuse was, but as I recall they had room for it in their apartment. Fourth time around it was stolen. Now I didn’t rub it in and say “I told you so” but the vandalism and theft were so predictable, especially in that time period (1980s), that a person had to be either stupid or dense not to heed good advice. I’ll grant vandalism and bike theft isn’t as big a problem as it used to be, but it’s hardly fallen to levels where I would feel comfortable leaving a bike outside 24/7, even in my own (relatively safe) neighborhood. If demand existed for it by me, I’d even be happy to let people without the space keep their bikes in my garage. The usual argument for “cheaping out” is that is costs less. Pedestrians and bikes mix pretty well, even if it isn’t the ideal situation. If you want to spend money in crowded places, spend if on taking unneeded space from cars, because cars are the main space wasters in crowded places. Could someone pls. post a link to the final rule change, assuming there was one, by the DSNY on this issue? I’m unable to find one via Google. Thanks. How Can DSNY Fix Its Process for Removing Abandoned Bikes?